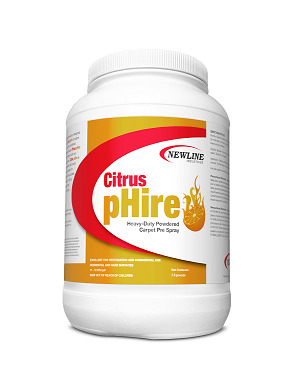 Citrus pHire is a heavy duty powdered carpet prespray designed for use in the restorative cleaning process. Citrus pHire contains the latest technology in cutting edge surfactants, powdered oxidizers, pH builders, citrus oils and green solvents. Citrus pHire dissolves easily in warm and hot water and starts to work immediately by dissolving grease and oils on contact. Its unique formula is excellent for the most heavily soiled commercial and residential carpets. To increase the performance use Newline Emulso extraction detergent, Natural Orange DS, New O2 or Final Rinse. For pump or electric sprayers: Dilute one scoop (2 oz.) per gallon for most soils and up to two scoops (4 oz.) per gallon for heavy soil. Use hot water. For injection sprayers: Dilute six scoops (12 oz.) per five quarts. Set dilution to 1:8. Use warm water. Application: Thoroughly wet surface to be cleaned with diluted solution. Allow 5 - 15 minutes of dwell time. Extract.